As 2016 comes to a close, we are humbled to witness the remarkable progress of ASEAN nations in the past year through our work across the region in driving enterprise adoption of IoT technologies. With a population of over 600 million, a nominal GDP of $2.31 trillion, and a clear evolution from a low-cost manufacturing base to a sturdy pillar of Asia’s GDP growth, there is little doubt that ASEAN is in the frontline of global growth. Dominating the IoT narrative in ASEAN are the issues on productivity and efficiency. This is unsurprising as it is important for ASEAN nations to improve their productivity and efficiency to catalyse and sustain its growth. To this end, we have seen how the different countries in the region are aggressively capitalizing on IoT technology in different verticals and sectors. As such, there is an apparent growth in the region when it comes to IoT technologies. Increasing adoption and deployment of IoT technologies in different public and private sector projects in Malaysia, Indonesia, and Philippines, as well as growing interest in emerging markets such as Vietnam, continue to drive this growth. In this year in review article, we look back at some of the themes and salient factors that we have witnessed through the five editions of Asia IoT Business Platform in 2016. IMF’s 2016 World Economic Outlook puts Myanmar as the world’s fastest growing economy, with Laos and Cambodia also making the top 10. These countries make up the emerging portion of ASEAN’s 10 economies. The other seven economies (Brunei, Indonesia, Malaysia, Philippines, Singapore, Thailand & Vietnam) are no slouches themselves with average GDP growth above 4%. The projections for the region remains robust over the next 2-3 years, with growth expected at 5-6%, compared to global growth of around 3%. Growth in this region has lured external investments in 2016, with many new entrants and incumbents aggressively growing their ASEAN focused teams. Alibaba gained a quick foothold into the region’s ecommerce markets with their $1 billion investment into Rocket Internet’s Lazada – a Southeast Asian focused e-commerce platform. Amazon has reportedly invested $600 million in Indonesia to build out their logistics platform in the region and is rumoured to be eyeing a Southeast Asian launch via Singapore in 1Q 2017. This year, we have seen how enterprises across different industries and verticals have adopted and deployed IoT technologies in their businesses, be it to improve productivity or to optimize different business processes. You can read some of the IoT projects that have been implemented by different enterprises, such as Vinamilk’s smart factory. Hence, it is no longer about educating enterprises across verticals about the benefits and potential of IoT; they know. What is critical at this point is to understand the pain points of enterprises in adopting and deploying IoT for their businesses and to communicate these challenges to IoT solutions providers. Further, it is also important to address the existing problems in the ASEAN markets, which mostly revolve around fragmentation of the IoT ecosystem. The end goal is to ensure that local enterprises that are looking to deploy IoT will be able to do so easily as solutions providers understand local factors and challenges facing these enterprises. Large enterprises are at the forefront of the digital transformation initiatives regionally, but SMEs offer a real growth opportunity for technology companies targeting enterprises in Southeast Asia. We’ve seen some innovative use of IoT technology being implemented by SMEs across different industries throughout this year. From harvesting durians with IoT for real-time data to enhancing patient care with health analytics, SMEs provide unparalleled opportunities for technology companies targeting adoption of enterprise IoT. Take Indonesia for example - there are close to 60 million SMEs in the country, growing almost 10% since 2009. These companies make up 99.9% of all enterprises in the country and contributes more than 60% to GDP. According to the Asian Development Bank (ADB), the number of SMEs in Vietnam and Philippines has grown more than 45% and 20% respectively, in the 5-year period from 2009 – 2014. New, and small, companies in these countries do not come with the problem of legacy systems. For example, in a 2016 State of the Cloud survey done by Rightscale, they found that 32% of SMEs are “Cloud Focused” vs 25% for large enterprises. This is exactly what I’ve seen in ASEAN in 2016 as the smaller, more nimble firms have been more aggressive in adopting IoT related solutions. On the opposite end of the spectrum, telecommunications companies represent ASEAN’s largest companies, with significant government ownership. These telcos have made strides in their efforts to be more than just a core connectivity provider for IoT (previously M2M) solutions. Usage of telecommunication services has shifted from SMS and voice to VOIP and messaging and telcos have had to futureproof their roles rather quickly. Over the past few years, we’ve also seen the regional telcos carve out IoT specific products and sales teams as they look to expand their offerings to their enterprise customers. Take Indosat for example; they hired a Head of M2M in early 2014 and have grown that team aggressively over the past 2 years. In November 2016, they launched their own IoT platform, Nexthing, to focus on helping local enterprises with their digital transformation initiatives. Local telcos also hire the largest local enterprise sales teams and have been proactive in exploring partnerships with technology solution providers to increase the suite of offerings. This is something that will continue to grow over the next 3-5 years and international companies should really consider telco partnerships as a potential avenue for local market entry. 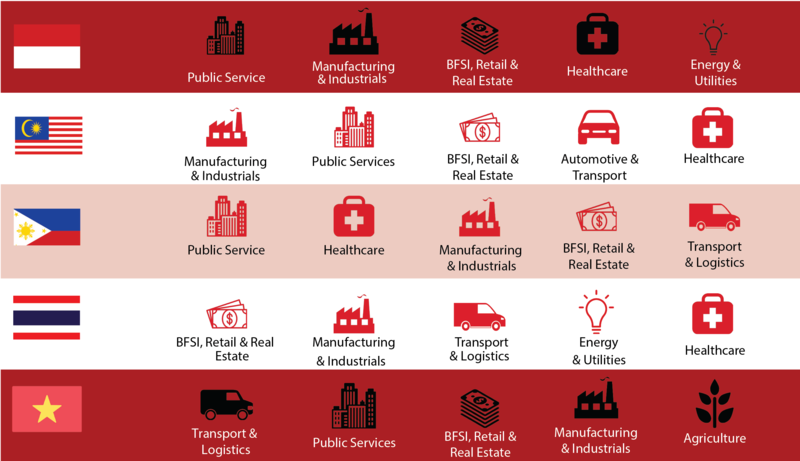 Lastly, through the different editions that we have held across ASEAN in 2016, we have identified the different industries/verticals that are dominant in each market and in which have the biggest potential for the deployment of IoT technologies. The chart below will give IoT solutions providers an idea of what to expect when exploring the different markets in ASEAN in 2017. Having hosted IoT programmes across ASEAN over the past four years, we have not only seen real potential for IoT technologies, but we have seen clear growth in the different markets too. While telcos are aggressively looking for partners to initiate different IoT projects, governments are also setting aside massive budgets and investments for the development of the respective ICT sectors. There is indeed no better time to access the enterprise IoT market in ASEAN and we will continue to facilitate the process of driving enterprise IoT growth as well as bridging international solutions providers with local enterprises. ASEAN is indeed the one to watch in 2017. If you're interested in exploring the different markets in ASEAN in 2017 and to find out more about the latest IoT developments in the region, join us at our debut in Singapore on 14 February 2017! The program will bring together IoT stakeholders from the region to engage in panel discussions and share on the latest and most relevant IoT case studies! Contact me at zaidani@industry-platform.com to find out more!